The Butterfield Garage welcomes back Carlyle Gibbs as February’s featured First Friday Exhibit. The new collection of metal, stone and canvas pieces will first be on display the night of Feb. 5, from 5-9pm during the St. Augustine First Friday Art Walk and continue throughout the month. Come meet the artists, Feb. 5 from 5-9pm at The Butterfield Garage, 137 King St! Their jewelry line includes both popular designs and one-of-a-kind pieces designed to create a signature look. The exhibition will also feature evocative paintings inspired by the depth of color and meticulous striations of natural gemstones. Through innovative painting techniques of gemstones, some of these spectacular lesser known gems are showcased to reveal the stones natural qualities. Be sure to take a look at the ruby red spinel, green tsavorite and firey orange Mandarin garnet. Kathryn and Cheryl will be speaking directly to attending guests about their new collection. Speaking points will include driving inspirations, motivations, challenges and artistic techniques behind their personal creations. Each artist is given the rare opportunity to elaborate upon their work, and to answer questions about their intriguing new creations, inviting guests to an open dialogue, discovering the history and intricacies of one of a kind wearable art creations and paintings. The Carlyle Gibbs collection offers visitors a breathtaking view of an artistic ecosystem. Each individual creation stands strong with a story all its’ own. Yet, in the details, metallic shimmers seem to inspire and reflect each other, as if the whole collection is connected. Shimmering metals find ways to illuminate corresponding paintings with a beautiful color infused mystery just as gemstones appear to borrow vibrant colors from the canvas. 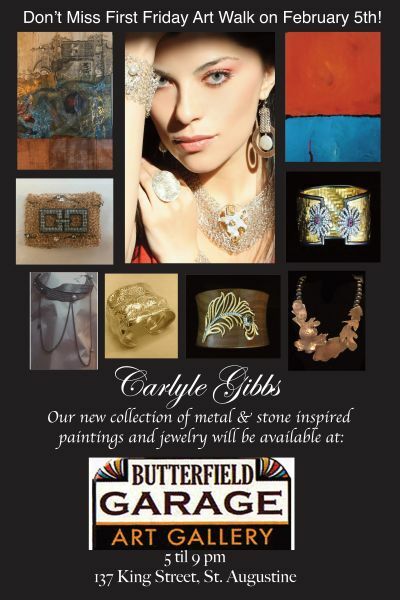 Take a walk over to Butterfield Garage this Friday night to experience the Carlyle Gibbs' illuminating world forget metallics and gemstone palettes. Internationally acclaimed local artists Cheryl Gibbs and Kathryn Carlyle have been collaborating for 9 years as Carlyle Gibbs, creating symbiotic collections of designs in both wearable and 2D art. As resident artists, both Kathryn and Cheryl's work can be admired year round at the Delray Beach Arts Arena, located at 777 E. Atlantic Ave in Delray Beach, FL. “Our passion for creating jewelry remains the same today as when we started,” they say. “The craft of manipulating metals and and gemstones into jewelry is a process that is both problem-solving and rewarding, and we learn something new each time we create a piece of jewelry. The Carlyle Gibbs First Friday Exhibition will commence on Friday, Feb. 5, 2016, and continue through Friday, Feb. 26, with showcase times of 5 -9 p.m. The Butterfield Garage Art Gallery is located at 137 King Street, Saint Augustine, Florida, and is open daily from 11-5. Please visit http://www.butterfieldgarage.com, or call (904) 825-4577.